The custom views allow each user to have his own monitoring view. A view may contain 1 to 3 columns. Each column can contain widgets. A widget is a module allowing certain information to be viewed on certain objects. It is possible to insert multiple widgets of different types in the same view. By default, Centreon offers widgets allowing to obtain information on: hosts, host groups, services, service groups. Finally, the last widget allows to view real time performance graphs. All the manipulations below take place in the page entitled Home > Custom Views. This page is also the first page displayed when a user logs into Centreon. 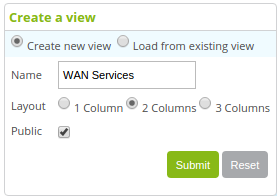 To add a view, click on Add view. To change an existing view, click on Edit view. The reduction in the number of columns removes the widgets associated with the column. It is possible to share an existing view with one or more users. To do this, click on Share view. To add a widget, click on Add widget. It is possible to move a widget by drag-and-drop from the title bar. To reduce a widget, click on . By default, the information contained in the widget is refreshed regularly. To refresh it manually, click on . To customize your widget, click on . It is possible to delete the widget by clicking on . The paragraphs below detail the attributes of each widget after clicking on .